29 Acres will include 14 homes with multiple floor plans; an 8,000 square foot community center; and outdoor areas including a swimming pool, activity fields, gardens and walking paths. Caddis and the non-profit organization 29 Acres hope to replicate the community in other parts of the country. CROSS ROADS and DALLAS, Texas, April 17, 2019 – In a continuation of its ongoing philanthropic initiatives, Caddis® announced that it is donating more than $400,000 and its real estate development expertise to build a new prototype housing and educational community designed to increase independence among young adults with Autistic Spectrum Disorder (ASD)*. 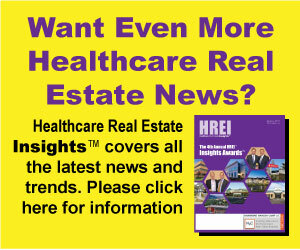 The “29 Acres” community is a partnership between the Dallas-based national healthcare real estate firm and the non-profit 29 Acres, which was founded by a group of concerned parents of adult children with autism. 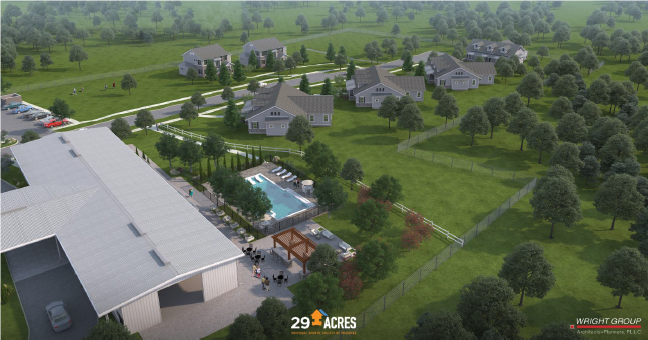 Their goal is to build a $12 million, 29-acre community at 3000 Mosley Road in Cross Roads near Dallas-Fort Worth that will provide homes; education; and recreational, skills development and other support services for up to 60 young adults with autism. When completed, the community is expected to employ about 200 full- and part-time staff. Caddis CEO Jason L. Signor said his firm is excited to help with such an important project. 29 Acres board members say the new community will fill an “enormous” need in Northern Texas. The 29 Acres community is being built in a safe, country-like environment, but it will also be conveniently located near several rapidly growing cities that provide important services and employment, educational, social and recreational opportunities. The community, which is being built in phases, will eventually feature a total of 14 homes of about 3,000 square feet each. The project also will include repurposing a barn into an 8,000 square foot community center that will house a communal dining area, kitchen for teaching cooking lessons, a library and computer center, fitness center, pre-vocational labs, and a leisure area for community events. The exterior of the community will feature a swimming pool, outdoor kitchen/cabana, activity fields, a basketball court and baseball field, organic gardens and greenhouses, and walking and biking paths. The first phase of the project, which is expected to be completed in early 2020, will include renovation/construction of the community center and pool, construction of six houses, development of supporting infrastructure and underground infrastructure, and landscaping. The general contractor for the project is Dallas-based Taurus Commercial Inc., the architect is Carrollton, Texas-based Wright Group Architects, and the civil engineer is Glenn Engineering, which is headquartered in Irving, Texas. *In 2013 the American Psychiatric Association broadened the scientific definition of autism to include all levels of functional severity under the name Autistic Spectrum Disorder (ASD). Autism or ASD refers to a wide range of conditions characterized by challenges with social skills, repetitive behaviors, speech and nonverbal communication. 29 Acres, a registered 501c3, was founded in 2015 by a group of families who share a similar need: Finding quality programming and safe housing for their young adults with autism in North Texas. When our children with autism were young, our efforts were directed towards seeking appropriate care and therapies, privately and through our educational systems, to ensure they were given opportunities to learn and make meaningful progress. As a result, their children have grown up to be wonderful young adults. Most continue to live with challenges typical of adults with ASD, but have skills that can make a real difference in their lives – skills that, if maintained, will allow them to successfully engage in the community, be productive at a job or volunteer position and enjoy friendships. At 29 Acres, we know they can have a life with purpose. We know they can have a happy life. For more information, please visit 29acres.org.